We’ve reviewed our fair share of WiFi routers in our time, and typed a varied mix of letters and numbers in naming them. Whereas a product name like A1200-ADF might mean something to a factory worker in Taiwan, to the average consumer it just sounds like nonsense. It’s the reason Apple call their flagship device simply ‘iPhone’ followed by a single number. So imagine our joyous surprise to receive a router with an actual name, and an evocative one at that. 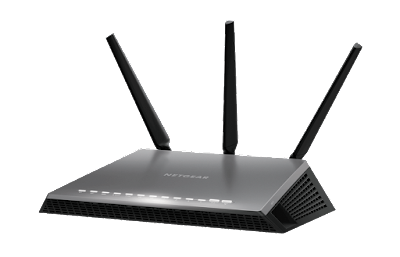 We review the Netgear D7000 Nighthawk. Nighthawk. Seriously, Netgear have called this the Nighthawk. You might think the name, which sounds like the guy waiting to step into Batman’s shoes should the worst happen to the caped crusader, is a bit much, it is actually pretty apt. Look at this thing – it looks like the car of the guy waiting to step into Batman’s shoes, but with really big radio aerials. It has that new-Netgear look of being exceptionally angular and sharp (such as the X6200 Range Extender) as well as clean and minimalist. But only a few people will care what this thing actually looks like – how it performs is surely the crucial factor. Here are your headlines: this is a VDSL/ADSL dual-band WiFi router (2.4 and 5GHz channels available) using 802.11ac WiFi technology. There are two USB 3.0 ports, five Ethernet ports, a WPS button, and 1GHz dual-core processor to do all the clever thinking. There is also a baterang, armour-plating, and machine guns for cutting holes in walls to drive through. Oh no, that’s the actual Batmobile, sorry. As ever, setting up this Netgear product is super easy, requiring only your IP login details. Once up and running we found that the Nighthawk projected a very strong WiFi field which not only completely blanket-covered all of Test Pit Towers (not a small house) but also stretched across the road, still giving us at least two bars of reception on most mobile devices. Obviously your internet speed will depend entirely on what you’re getting from your IP, but the Nighthawk is capable of 1.9Gbps. 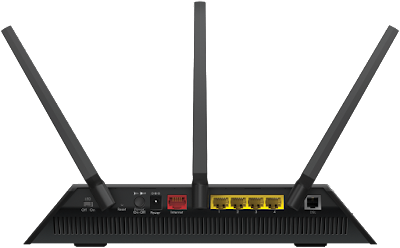 It also features Beamforming+, where the router will focus a concentrated stream of connectivity at a particular device, be it your phone, tablet, laptop, or smart TV. 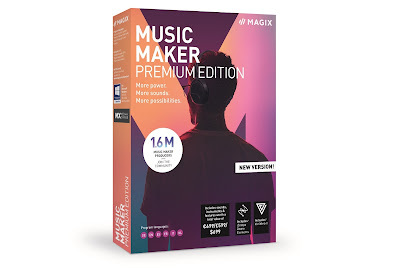 This is a pretty handy tool for gamers who need a constant and strong connection, but also great if you normally just use a couple of WiFi devices about the home. The D7000 Nighthawk can also be accessed, controlled, and – crucially – repaired via Netgear’s Genie app for Android and iOS. This extremely useful app allows you to not only set up the router, but to check connectivity and diagnose problems. If you ever have internet issues, then instead of staring blankly at a light on the router, hoping beyond hope for it to start blinking again, you whip open the app to see what the issue is. We found this to be really helpful, as it put the control back into our hands (as opposed to ringing up the IP and complaining of no Netflix). 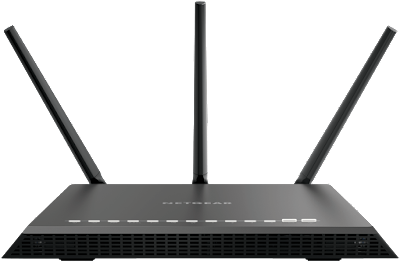 So yes, a cool name and great looks, but the Netgear D7000 Nighthawk is a very capable WiFi router that can handle pretty much anything you can throw at it.